A bat isn't just a piece of wood. 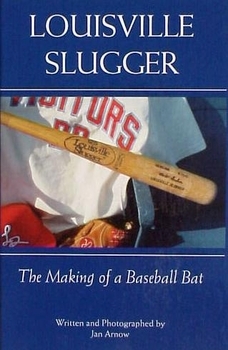 Many skilled workers perform the painstaking, time-consuming steps that create the Louisville Slugger bats used by every major and minor league baseball team in America. Louisville Slugger takes you behind the scenes to trace the making of a baseball bat. You'll meet the people who do all the work, from the forester who selects the trees to the woodturning specialist who custom-tailors the bat to the players' exact specifications. With clear, detailed photographs and a text packed with baseball lore, this book is a charming biography of the century-old star of our favorite national game. Jan Arnow is an internationally-recognized authority on craft and ethnic traditions whose book, By Southern Hands, was among the first to showcase southern craftspeople. She is an award-winning photographer and the highly-respected author of seven books and scores of articles for a variety of national magazines. She has designed and taught courses and workshops in alternative photographic processes, textile design, visual communications and the business of art, and has lectured at museums ranging from the Smithsonian Institution to the DeYoung Museum in San Francisco.